I am providing you Professional and Clickable Email Signature for you. An E-mail signature is a block of text placed at the bottom of an E-mail message. An Email Signature Represent Your Company's Professionalism. signature that is smoothly editable & w3c standard Code. you will append a signature automatically to the bottom of outgoing e-mails. * Handwritten HTML Code 100% Spam Free. * Business LOGO or HEAD-SHOT embedded. * Clickable Phone Number, E-mail, & Website . * Clickable Social icon & address location directed to Google map. * Copyable & Selectable text. * Free Installation instructions for the E-mail Signature & Unlimited Support. * E-mail signature support all E-mail platforms like Gmail, Outlook, Yahoo, MacMail & many more. 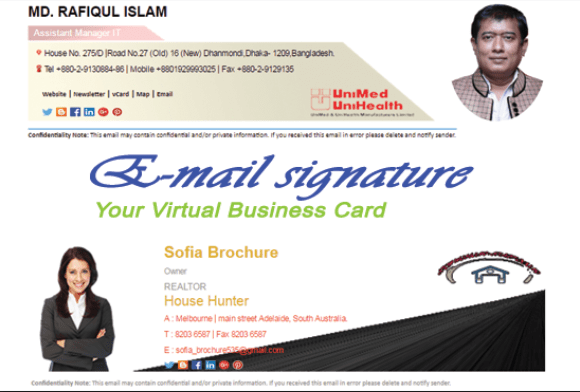 HTML Email Signature your virtual business card is ranked 5 out of 5. Based on 1 user reviews.